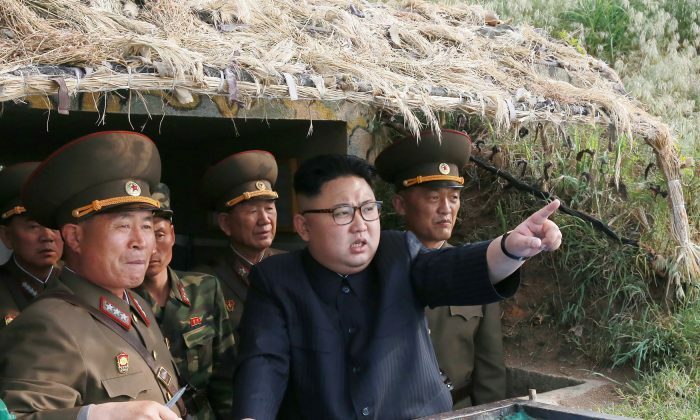 North Korea has claimed that earlier this year, the United States tried to kill the country’s leadership by sending spies into the country who failed to carry out an assassination plot. State-run Korean Central News Agency (KCNA) said on Friday, Oct. 6, that in May of this year, the United States and its “puppet” South Korea sent agents to the headquarters of Kim Jong Un to carry out “state-sponsored terrorism” using biological and chemical weapons. In May, the reclusive communist regime claimed that a man named only as “Kim” was sent to infiltrate North Korea’s leadership and assassinate its leaders. For years, North Korea has accused the United States and South Korea of scheming to carry out a chemical attack against the state called Plan Jupiter. Whether these claims have any substance is unclear. The CIA has not commented on the recent accusations, however, President Donald Trump has said “all options are on the table,” in regard to North Korea over its provocative missile tests and the buildup of its nuclear arsenal. North Korea launched a missile over Japan, an ally of the United States, on Sept. 15, and on Aug. 25, launched three missiles into the sea between Japan and the Korean Peninsula. North Korean leader Kim Jong Un (not pictured) guides the launch of a Hwasong-12 missile in this undated photo released by North Korea. “Just like a chameleon changes its colors, the U.S. frequently changed the pretext of ‘counter-terrorism’ and ‘non-proliferation’ according to its need, and used them to overthrow legitimate governments in Afghanistan, Iraq, and Libya one by one by waging military attacks on those countries,” it said. Two women are being tried in Malaysia for the killing of Kim Jong Un’s half brother, Kim Jong Nam, who became estranged from, and was openly critical of, his family. The women who smeared Kim Jong Nam with a deadly VX nerve agent have pleaded not guilty, saying they were duped into believing they were acting in a prank TV show when they smeared the chemicals on Kim Jong Nam’s face. Some of the men who orchestrated the attack were sent back to North Korea in a prisoner exchange after North Korea kept Malaysian citizens from leaving the country following Kim Jong Nam’s death. North Korea has yet to acknowledge the relation between Jong Nam and the current leadership, and claims “the man” died of a heart attack. “It is a consistent stand of the DPRK government to oppose all forms of terrorism and any support to it,” the KCNA report states.